Walk the ghostly path of rowdy women on the St. Michaels Ghost Walk. This awesome historic town with great shopping and restaurants is also home to very rowdy women spirits who may just toss a wine glass in your direction – or order you off the lawn. Learn about the irate landlady who torments her tenants and the mischievous restaurant ghost who throws wine glasses and haunts the bathroom. Hear about the hippie in the park and the lady who haunts the Old Brick Inn. And watch for a few ladies of the evening who have never left their brothel … even after it became a public tourist spot. Beautiful St. Michaels, sitting so peacefully on the Miles River has some lonely and rowdy women spirits who get about town at night. Join this ghost walk to hear their stories. The walk begins in front of the Chesapeake Bay Maritime Museum and makes its way through around the St. Michaels harbor and around St. Michaels historic downtown. Visit an old cemetery and hear stories about St. Mary’s Square where ghosts of unremembered dead once haunted a school that was on the Square. Visit the Victoriana Inn where a spirit of a former guest is still trying to pay his bill. Learn about the ghost in St. Michaels Town Hall, the house of a steamboat captain and a site that was once a brothel is said to still be “active.” The walk is about 1.5 miles and lasts about an hour and a half. PLEASE NOTE: WE DO NOT GO INSIDE THE PROPERTIES. This is a ghost walk where stories of hauntings and unexplained events are shared while standing outside the property. St. Michaels is approximately 45 minutes east of the Chesapeake Bay Bridge, and is a worthy tourist destination at any time of the year. But seeing it at night and hearing about it’s haunted history is a special experiences. MEETING PLACE: Meet 15 minutes before the start of the tour in front of the Chesapeake Bay Maritime Museum entrance. 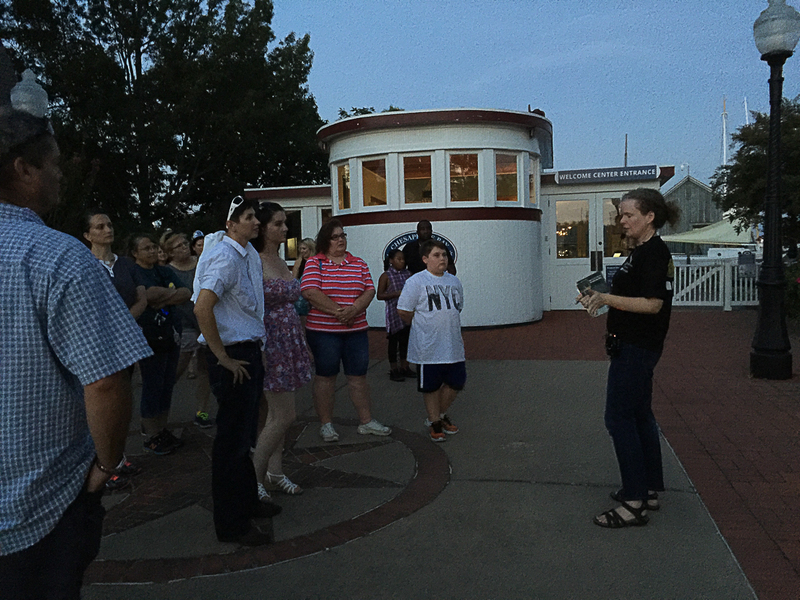 TIME & WEATHER: Ghost Walk begins on time. We walk in all kinds of weather except heavy rain and thunder storms. Dress for the weather and be aware that each ghost walk takes at least an hour and covers between 1 and 1.5 miles. Bring a camera. That’s part of the fun. CANCELLATIONS AND REFUNDS: Full refund will be given if cancellation is made 48 hours prior to the tour’s start. If cancellation is NOT made within 48 hours of the tour, no refunds will be given. For reservations of 6 or more, we require 72 hours. However, all registrations are transferable, so feel free to allow a friend or family member to attend in your place. Just give them your order voucher. Are your ghost walk tours only on weekends? We will be in St Michaels on a Thursday in July. Thank you! Hi there, Larra. Unfortunately, we only have the St. Michaels tour on the weekends at this time. Sure Lacy. We’ll email you. Why don’t you go inside the properties? Hi Star. Our tours are modeled after all the other large ghost tours of cities on the East Coast. Charleston, Savannah, Gettysburg, St. Augustine, Key West — even New Orleans. None of these ghost tour (the walking tours) bring guests inside properties. The product is a walking tour of the town with a storyteller telling the haunted tales. We do, however have other products where we take guests inside haunted properties. All of our bus tours have a “in-property” component. We also have a paranormal investigation monthly that takes guests into haunted properties. Thanks for reaching out with your question. Had a great time last night for our St. Michaels Ghost Walk. Guide DeeDee really made the experience informative and spooky and one my wife and I look forward to doing again very soon ! I am interested to know if there are any “healing trees” on this tour. I have seen on some pages that there are but not on all. Thank you in advance. Hello, Laura. Our St. Michaels Ghost Walk does not include any healing trees. However, Berlin, Princess Anne and Easton do have them. Easton is pretty close to St. Michaels so that walk would probably be the best option for you if you wanted to stay closer to the St. Michaels area. Where could I find the pics Amanda took of our little group last week? Are leashed, well behaved dogs allowed on the ghosts walk? Thanks! We are all dog lovers, Sharon. As long as dogs are on a leash and don’t frighten or bother any of the guests, we have not problem. Having lived in the area from 77 -83, I’m looking forward to my wife and I having a spoooooky evening.. Looking forward to this tour!! Wendy, we have just added a 9:30 pm tour for this Friday the 13th. Otherwise all the tour dates for the St. Michaels tour can be found at the link atop this email. thanks for checking in.